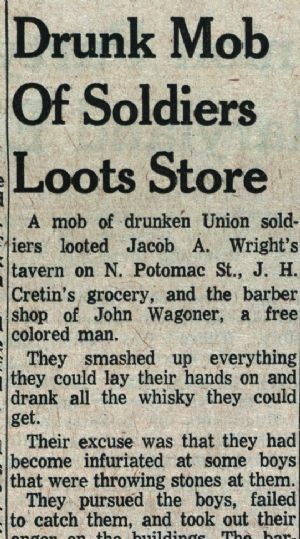 A mob of drunken Union soldiers looted Jacob A. Wright’s tavern on N. Potomac St., J. H Cretin’s grocery, and the barber shop of John Wagoner, a free colored man. They smashed up everything they could lay their hands on and drank all the whisky they could get. Their excuse was that they had become infuriated at some boys that were throwing stones at them. They pursued the boys, failed to catch them, and took out their anger on the buildings. The barroom door of the hotel was broken down, a stone thrown thru one of the window shutters and the glass lamp in front broken and other damages were inflicted. An estimated $100 damage was done to the grocery store. The Herald of Freedom and Torch Light compared this stone throwing with the attack on the Massachusetts troops this April as they passed through Baltimore but added that it did not condone the soldier’s action. While urging unit commanders to keep closer control of their troops, the Herald and Torch urged the citizens of Hagerstown to treat their protectors with politeness. This is but the worst of a number of tumults and disturbances occuring between soldiers and citizenry here. One favorite distraction is the reckless riding through the streets, to the great danger of pedestrians.